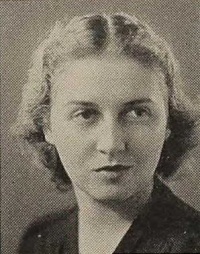 Louise Falk (née Kanazireff) was the first wife of Lee Falk from 1935 until 1944 (1945 ?). The surname has been written slightly differently as a result of the transliteration from Bulgarian Cyrillic orthography to the Latin alphabet. Vladimir Kanazireff was born in Razlog (Bulgaria) and was educated at the military college in Sofia . In 1908   he was in US, and early 1909 he visited the Rooch family in St. Louis . He and Lillian Rooch fell in love, but he had to leave due to his new job as an attache of the Bulgarian legation at Paris. Early 1910 Lillian announced her engagement to Capt. Vladimir Kanazireff  and said that she was leaving to Eureka Spring to stay for a time before starting to Paris where the wedding will take place in June. Louise was born October 25, 1911 when Lillian visited her family St. Louis . In October 1912 Lillian wrote her mother that her husbond's healt has been falling for some time, and her mother decided to go to Paris. But in Paris Louise Rooth was taken ill and her daughter decided to take her mother home to St. Louis. At sea Louise Rooth suddenly succumbed to heart disease and died . Lillian left St. Louis after the funeral, but returned when her husband joined the 7th Rila Infantery Division, to fight in the Balkan Wars. During the WW1 Vladimir Kanazireff was in the Bulgarian army, retiring with the rank of major . He then attended the Sorbonne University in Paris where he specialized in history and law at the School of Political Science  [footnotes 1]. In St. Louis Louise's first first public stage performance was as one of the pupils of the Mahler School of Dancing in 1916, as one of the dancers in the musical comedy "Undine" at Shubert Theatre . The next year she was one of the specialty dancers ("Chickens") in the play "The Broken Doll" . The play was presented at the Jefferson Theatre in St. Louis, to celebrate the end of the scholastic year of the Mahler School of Dancing. Then she danced dressed as a aeroplane in the play "Miss Yankey Doosle" at Jefferson Theatre . At the Odeon she was part of the cast, performing in the play "The Golden Years" to celebrate Jacob Mahler's fiftieth anniversary as a teacher of dancing in St. Louis . Miss Irma Summa[footnotes 2] had returned to St. Louis to teach dancing in 1918 and Louise became one of her pupils. After the WW1 Lillian had tried to obtain passport for her husband and finaly, after the services of senator Spencer, Vladimir Kanazireff could move to St. Louis . In St. Louis he found his work as a teacher at McKinley, Soldan, Beaumont and Southwest High Schools . Louise performed as one of Irma Summa's pupils in a dance recital at Wedensday Club Auditorium in 1921  and the dance and song recitals at Pershing Theater in 1923 . The dance poem, "Fairies' Midnight Frolie" was originated by Irma Summa. In the US Fedral Census of 1930  only Vladimir Kanazeriff is listed (as boarder). Lillian and Louise returned from France in August , and Louise graduated Roosevelt High School  in 1932. Louise attended the Washington University . At the University she joined Thyrsus, the dramatic society of the Washington University. She had a role in the annual production, "Mr. Pim Passes By", at the Wednesday Club May 13 and 14 . Louise acted in The Little Theatre of St. Louis' [footnotes 3] production of "The Little Clay Cart" , at an outdoor amphitheatre of John Burroughs School July 12-16. Louise was to be part of The Little Theatre's next play, "Night Over Taos" to opened 25 Jan 1934 . But due to the sudden death of Neal Caldwell, the associate director, the play was abandoned. At the Washington University Louise joined the Quadrangle Club. In 1933 (May 11-13) at the January Courtroom they presented the revue "One Small Cheer", a tabloid version of "French Class" and "Rose of Arizona", with Louise as part of the cast in "Rose of Arizona" . The engagement in the January Courtroom was a success and "One Small Cheer" was put up at Fox Theatre [footnotes 4] the week of June 2-8 . Louise played her first leading role in the student play "Twinkle, Twinkle, Little Star" (by Jane W Blackmer) at the Washington Univesity . In Prof. Carson's class in technique of the drama Louise wrote the play "Veils (The) Veil))", which later became one of ten plays in a Play Service. Established to give high school, college and church theatrical groups the opportunity to produce plays written by students at the university . Louise married Leon H. E. Falk in 1935 , and after graduating in 1936 they moved to New York City. In NY Louise studying with Frances Robinson Duff , but the newly married couple also traveled extensively in Europe and the Middle East the next two years. In 1939 Louise made her debut in the Farragut Playhouse at Rye Beach (New Hampshire) as part of their resident company . Louise and Lee's daughter Valerie was born May 23, 1940. This year Lee Falk had been involved in the Cambridge Summer Theatre and Louise acted as part of their resident company from 1941. Due to Lee Falk's WWII obligation Louise also took care of Lee's responsibilities at the Cambridge Summer Theatre in the years 1942 to 1944. In 1943 Louise changed her acting name to Louise Valery and she met her future husband, Richard Comstock Hart. Richard Hart later said that paradoxically enough while appearing in "Without Love", love walked in, and a few months later Louise became Mrs. Richard Hart. In 1944, both Richard (John) and Louise (First Witch) played in "Dark of the Moon" and the Shuberts came from New York to see it. After some weeks on the road the "Dark of the Moon" opened at the Forty-Sixth Street Theatre in New York, starring Richard Hart and Carol Stone. Between the performances of "Dark of the Moon" Richard Hart also found time to touring local schools as Romeo in "Romeo and Juliet". After ten months' run of "Dark of the Moon" in New York Richard and Louise married, just before the the following "Dark of the Moon" tour, in which they both appeared. While with the played in Chicago spring 1946 the couple went to Hollywood. Richard Hart started the shooting of "Desire Me" and next the "Green Dolphin Street". After a preview of "Desire Me", instead of going home Louise went straight to Cedars of Lebanon Hospital and their first daughter was born shortly before midnight. Late spring 1947 the Harts found time for a vacation. First they took of to Ensenada (Mexico) for a honeymoon for several weeks. Then, after Richard's parent had visited them a few weeks in Bevely Hills, they spent another vacation at Palm Springs[footnotes 5]. Returning to their Beverly Hill home Richard started shooting B.F.'s Daughter, and producers negotiated[footnotes 6] with Louise in the cast of a new play by Edwin O'Hanlon and Eleanor Roberts, "How Far Can You Go". Richard made his fourth film, "Reign of Terror"/"The Black Book", before he returned to the theatre. They took an apartment in New York and sub-letted[footnotes 7] their Beverly Hills home late 1948. They also told that they would have their second child in August. In addition to the theater, Richard also start making television films in 1949. He met Felicia Montealegre and his final years were spent in a relationship with her. Richard Hart died in 1951, and Louise married Peter Cadby and their daughter was born in 1952. Louise may have acted in radio, television and theatre throught the forties, but she most likely spent most of her time raising a family. Eary sixties she received her M.A. degree in theater from Hofstra University. From Long Island University of Hauppauge she also had pursued additional studies. In 1968 she moved to Estern Shore and started as an instructor of English, speech and drama at Chesapeake College. In 1972 she advanced to assistant professor of speech and drama at the Chesapeake College. In 1985, Louise retired as assistant professor of speech and drama after 17 years at Chesapeake and moved to New England. To honor Louise Cadby a campus theatre was named after her, known as the Cadby Theatre. ↑ Early 1940s Lee Falk said he saw a beatiful girl (Louise) in a drama one night and thought: "That's the girl I'm going to marry". He became a stage-door Johnny and later married her. - This might be the play Lee Falk referred to. ↑ Several sources mentions that Richard Hart and Phyllis E Buswel had a relationship that bore a son in September, 1947. ↑ The play doesn't seem to have been staged. Life 11 Sept 1944 "Dark of the Moon"